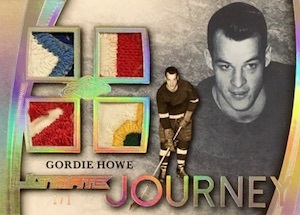 Driven by a mix of hits along with rookie-year autographs for Jack Eichel, 2015-16 Leaf Ultimate Hockey offers a premium option for hockey collectors. 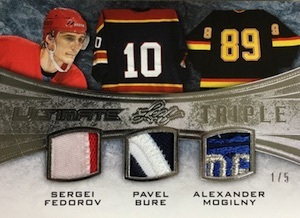 Each box includes six total hits. 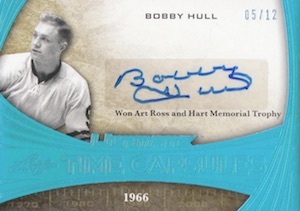 Featuring only autographs or memorabilia cards, signed options include Honored Members inserts that only showcase Hall of Fame players, and Time Capsule inserts that honor a key moment for top players. 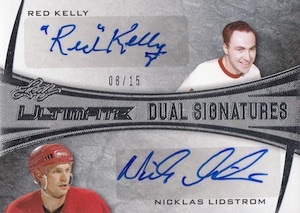 Ultimate Six, Ultimate Triples, Ultimate Quads feature a variety of combo signature cards. 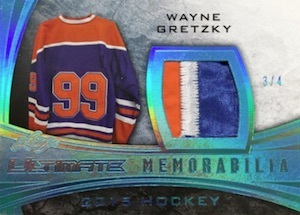 Other choices include Ultimate Signatures and Ultimate Auto Memorabilia. 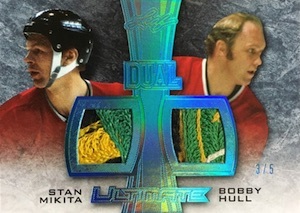 Hihglighting a mix of memorabilia pieces and items, relic cards include Enforcers, Tag Teams, The Ultimate Card, The First Six Franchise, Ultimate Dual, Ultimate Equipment, Ultimate Eight, Ultimate Journey, Ultimate Logos, Ultimate Quad, Ultimate Tag Team and Ultimate Triple. While limited, collectors can find one Jack Eichel autograph per case. 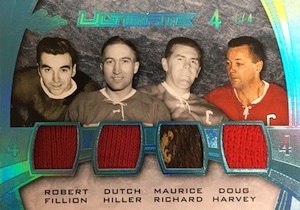 The full production for 2015-16 Leaf Ultimate Hockey is 1,500 boxes (250 cases). 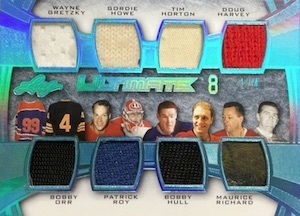 2015-16 Leaf Ultimate Orr Gretzky Howe Triple Patch Card #2 2!! eBay 1 1!! SICK! Note: See spreadsheet for specific print runs. 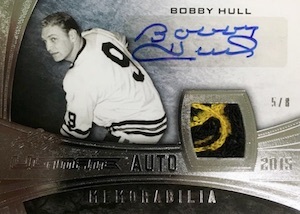 Will the Ultimate Signature Set autograph be on-card or sticker? I hope it’s on-card! Do we know if its going to be on a thick card ? 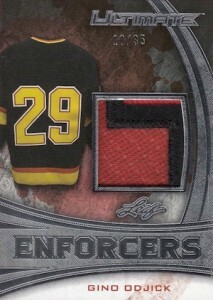 No NHLPA license and sticker autos make this set not worth it for me. 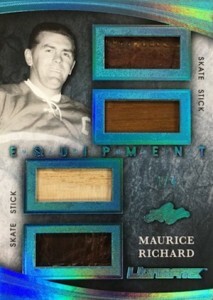 At $250 a box for 6 cards that stuff is way overpriced. Great product! Just busted a case and it’s fantastic value for the $.